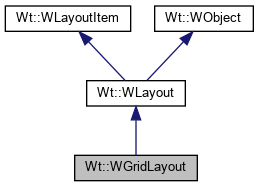 A layout manager which arranges widgets in a grid. This layout manager arranges widgets in a grid. Each grid cell (row, column) may contain one widget or nested layout. Horizontal and vertical space are divided so that each non-stretchable column/row is given its preferred size (if possible) and the remaining space is divided according to stretch factors among the columns/rows. If not all columns/rows can be given their preferred size (there is not enough room), then columns/rows are given a smaller size (down to a minimum size based on widget minimum sizes). If necessary, the container (or parent layout) of this layout is resized to meet minimum size requirements. The preferred width/height of a column/row is based on the natural size of the widgets, where they present their contents without overflowing. WWidget::resize() or (CSS width, height properties) can be used to adjust the preferred size of a widget. The minimum width/height of a column/row is based on the minimum dimensions of contained widgets or nested layouts. The default minimum height and width for a widget is 0. It can be specified using WWidget::setMinimumSize() or using CSS min-width and min-height properties. You should use WContainerWidget::setOverflow(OverflowAuto) or use a WScrollArea to automatically show scrollbars for widgets inserted in the layout to cope with a size set by the layout manager that is smaller than the preferred size. When the container of a layout manager has a maximum size set using WWidget::setMaximumSize(), then the size of the container will be based on the preferred size of the contents, up to this maximum size, instead of the default behaviour of constraining the size of the children based on the size of the container. A layout manager may provide resize handles between columns or rows which allow the user to change the automatic layout provided by the layout manager (see setRowResizable() and setColumnResizable()). Columns and rows are separated using a constant spacing, which defaults to 6 pixels by default, and can be changed using setHorizontalSpacing() and setVerticalSpacing(). In addition, when this layout is a top-level layout (i.e. is not nested inside another layout), a margin is set around the contents. This margin defaults to 9 pixels, and can be changed using setContentsMargins(). For each column or row, a stretch factor may be defined, which controls how remaining horizontal or vertical space is used. Each column and row is stretched using the stretch factor to fill the remaining space. When the stretch factor is 0, the height of the row and its contents is set to the preferred size (if possible). When the stretch factor is 1 or higher, these widgets will be given the remaining size, limited only by their minimum size (their preferred size is ignored). This layout manager is applicable only to WContainerWidget container widgets. You may use it within an Ext::Container indirectly by first setting a WContainerWidget using a WFitLayout. Create a new grid layout. The grid will grow dynamically as items are added. Use parent = 0 to create a layout manager that can be nested inside other layout managers or if you use WContainerWidget::setLayout() to add specify the container later. Adds a layout item to the grid. Adds the item at (row, column). If an item was already added to that location, it is replaced (but not deleted). An item may span several more rows or columns, which is controlled by rowSpan and columnSpan. The alignment specifies the vertical and horizontal alignment of the item. The default value 0 indicates that the item is stretched to fill the entire grid cell. The alignment can be specified as a logical combination of a horizontal alignment (Wt::AlignLeft, Wt::AlignCenter, or Wt::AlignRight) and a vertical alignment (Wt::AlignTop, Wt::AlignMiddle, or Wt::AlignBottom). Adds a nested layout item to the grid. Adds the layout at (row, column). If an item was already added to that location, it is replaced (but not deleted). Adds the widget at (row, column). If an item was already added to that location, it is replaced (but not deleted). The widget may span several more rows or columns, which is controlled by rowSpan and columnSpan. The grid dimensions change dynamically when adding contents to the grid. Returns whether the user may drag a particular column border. This method returns whether the border that separates column column from the next column may be resized by the user. Returns whether the user may drag a particular row border. This method returns whether the border that separates row row from the next row may be resized by the user. Sets whether the user may drag a particular column border. This method sets whether the border that separates column column from the next column may be resized by the user, depending on the value of enabled. If an initialSize is given (that is not WLength::Auto), then this size is used for the width of the column, overriding the width it would be given by the layout manager. Sets the stretch factor for column column. The default horizontal spacing is 9 pixels. Sets whether the user may drag a particular row border. This method sets whether the border that separates row row from the next row may be resized by the user, depending on the value of enabled. If an initialSize is given (that is not WLength::Auto), then this size is used for the height of the row, overriding the height it would be given by the layout manager. Sets the stretch factor for row row. The default vertical spacing is 9 pixels.